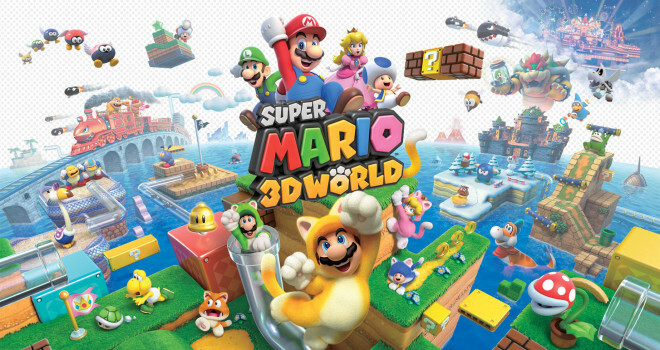 Super Mario 3D World is similar to Mario 3D Land in it’s gameplay style. Which is basically taking aspects from the classic 2D Mario games and transforming them into a 3D platforming experience. Only this time, they’ve pretty much perfected the formula and have created one of the greatest Mario adventures of all time! Bowser, for once has not kidnapped the Princess this time around, but has instead captured 7 fairy-like creatures known as ‘Sprixies’, and it’s up to Mario and his friends to get them back! The game features 4 playable characters from the start, all with different traits that makes them special in their own way. Mario is the most well-rounded, Luigi has slippery controls but jumps the highest, Blue Toad can’t jump very high but can run the fastest, Peach moves the slowest but has can hover while in the air. Sound familiar? Basically they’ve taken all of their abilities from Super Mario Bros. 2, and implemented them in this game which was a very nice touch! For the first time ever in a 3D Mario adventure, we can have up to 4 players playing cooperatively which is always a ton of fun! It’s just a shame that Nintendo still isn’t embracing online play, as this game can only be played with local friends in the same room, which is a disappointment. We understand that Nintendo wants to encourage playing the game in the same room to bring family and friends together, but if you don’t give the option to play online, it hurts the people who don’t really have local friends to play with. In this generation many friends are also made online, so hopefully Nintendo will get the ball rolling on making these games (besides Mario Kart) online. This is my only real complaint about the game. The games includes a large variety of power-ups such as the Fire Flower, Boomerang Suit, the newly added (and very useful) Cat Suit and many more. Throughout the game you’re constantly running into new power-ups and items that you can interact with. You can pick up bombs and throw them, carry a Piranha Plant that gobbles up enemies and even carry around a cannon! This game really delivers when it comes to a variety of items and power-ups and it’s the most we’ve seen in a long time! Only thing that’s really lacking is unfortunately Yoshi, who you can say was replaced by a Sea-Dinosaur called Plessie. There are many collectible Green Stars (3 in each stage) that you have to collect in order to unlock new stages. There are some special stages however where you can collect several. They are pretty fun and interesting challenges where you go through a set of small mini stages as fast as you can to collect a Green Star and then advance to the next small challenge. There are others called ‘Captain Toad’ where you play as Toad through a small but fun puzzle stage to collect more Green Stars. Green Star collecting adds a nice additional challenge and are rewarded nicely with new special stages from the more you collect! With more than 80 stages to play through, (plus more you can unlock), there is a very healthy amount of replay value to be had even after completing the game’s main story, which is always a huge plus! The difficulty is fairly easy form the start, but picks up as you progress through the game. After unlocking the many special worlds, your skills will definitely be put the test, with some of the most challenging levels ever put into a Mario title! This gives both casual and experienced gamers alike a great gameplay experience! The graphics surprised many people, as they didn’t look all that great on the early E3 previews. But there has been major improvements, making this game beautiful to look at! It runs at a consistent framerate with no slowdowns, you can see grass blowing in the wind, beautiful sparkling water, and very nicely done blur and particle effects on certain bosses. The special effects in general tend to look very nice and it has that detail and polish that Nintendo is known for, both graphically and gameplay-wise. The music in this game is a masterpiece! They are done by a live orchestra and some of the catchiest Mario tunes can be heard here! Each track suits the levels very well and have a very elegant and majestic feel to them, similar to what you would hear in the Mario Galaxy series. Super Mario Galaxy is not only one of the best titles on the Wii U, but it’s also one of the best Mario adventures to date! As stated before, the only real downside is the lack of online play and the lack of Yoshi (only if you love Yoshi THAT much…) Definitely a must have for any Wii U owner!